Question 1:	Name the parts of an angiosperm flower in which development of male and female gametophyte take place. Answer: Male gametes develop inside the anther and the female gamete develops inside the ovary. Question 2:	Differentiate between microsporogenesis and megasporogenesis. Which type of cell division occurs during these events? Name the structures formed at the end of these two events. Answer: The process leading to formation of microspores or pollen is called microsporogenesis. The process leading to formation of megaspore or ovum is called megasporogenesis. Meiosis takes place during these events. Pollen grains are formed at the end of microsporogenesis. Egg is formed at the end of megasporogenesis. Question 3:	Arrange the following terms in the correct developmental sequence: Pollen grain, sporogenous tissue, microspore tetrad, pollen mother cell, male gametes. Answer: Sporogenous tissue – Microspore tetrad – pollen mother cell – pollen grain – male gametes. 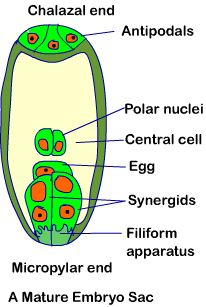 Question 4:	With a neat, labelled diagram, describe the parts of a typical angiosperm ovule. Answer: The ovule is a small structure attached to the placenta by means of a stalk called funicle. The body of the ovule fuses with funicle in the region called hilum. Thus, hilum represents the junction between ovule and funicle. Each ovule has one or two protective envelopes called integuments. 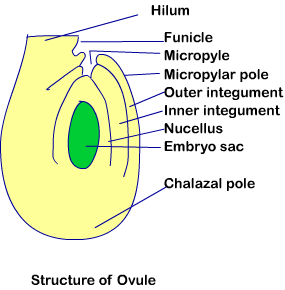 Integuments encircle the ovule except at the tip where a small opening called the micropyle is present. Opposite the micropylar end, is the chalaza. The chalaza represents the basal part of the ovule. Question 5:	What is meant by monosporic development of female gametophyte? Answer: In a majority of flowering plants, one of the megaspores is functional while the other three degenerate. Only the functional megaspore develops into the female gametophyte (embryo sac). This method of embryo sac formation from a single megaspore is termed monosporic development. Question 6:	With a neat diagram explain the 7-celled, 8-nucleate nature of the female gametophyte. Answer: Three cells at micropylar end makes the egg apparatus. The three cells at the chalazal end are called antipodals. These are uni-nucleate cells. The seventh cell at centre contains two nuclei which are polar nuclei. Question 7:	What are chasmogamous flowers? Can cross-pollination occur in cleistogamous flowers? Give reasons for your answer. Answer: When a flower exposes its anthers and stigma, the flower is open to pollination from any other flower. This condition is called chasmogamy and such a flower is called chasmogamous flower. Complete autogamy is rare in chasmogamous flower. Perfect synchronization between pollen release and stigma receptivity is required in such flowers to allow self-pollination. Question 8:	Mention two strategies evolved to prevent self-pollination in flowers. In some species, pollen release and stigma receptivity are not synchronised. Either the pollen is released before the stigma becomes receptive or stigma becomes receptive much before the release of pollen. In some other species, the anther and stigma are placed at different positions so that the pollen cannot come in contact with the stigma of the same flower. Question 9:	What is self-incompatibility? Why does self-pollination not lead to seed formation in self-incompatible species? Answer: Self-incompatibility is one of the tools to prevent in-breeding in flowering plants. This is a genetic mechanism and prevents self-pollen (from the same flower or other flowers of the same plant) from fertilising the ovules by inhibiting pollen germination or pollen tube growth in the pistil. Due to this, in self-incompatible species self pollination does not lead to seed formation. Question 10:	What is bagging technique? How is it useful in a plant breeding programme? Answer: Emasculated flowers have to be covered with a bag of suitable size, generally made up of butter paper, to prevent contamination of its stigma with unwanted pollen. This process is called bagging. Bagging helps in preventing unwanted pollination and in introducing desirable characters in a plant. Question 11:	What is triple fusion? Where and how does it take place? Name the nuclei involved in triple fusion. Answer: During fertilization in flowering plants, one of the male gametes fuses with the egg and thus zygote is formed. Another male gamete fuses with two polar nuclei; leading to formation of Primary Endosperm Nucleus. Formation of PEN involves fusion of three haploid nuclei. Hence, this process is called triple fusion. Question 12:	Why do you think the zygote is dormant for sometime in a fertilised ovule? Answer: Further development of zygote into embryo and subsequent development of embryo need food resources. The food is provided by endosperm. Hence, endosperm needs to develop to ensure development of embryo. Hence, zygote remains dormant for some time till endosperm develops. Answer: The portion of embryo above the cotyledons (in dicot seed) is called epicotyl. It represents the plumule or shoot tip. The portion of embryo below the cotyledons is called hypocotyl. It represents the radical or root tip. Epicotyl develops into stem and hypocotyl develops into root. Answer: In monocot seed, the embryonal axis has the radical and toot cap enclosed in an undifferentiated sheath. This sheath is called coleorrhiza. The portion of the embryonal axis above the level of attachment of scutellum is called epicotyl. The epicotyl has a shoot apex and a few leaf primordial enclosed in a hollow foliar structure. This hollow structure is called coleoptile. Answer: The outermost protective covering of ovule is called integument, while the outermost protective covering of seed is called testa. Integument is a living structure while testa is a dead structure. Answer: In some seeds, remnants of nucellus are also persistent, e.g. black pepper and beet. This residual, persistent nucellus is the perisperm. The wall of the fruit is called pericarp. Pericarp develops from the wall of the ovary. Question 14:	Why is apple called a false fruit? Which part(s) of the flower forms the fruit? Answer: In apple, thalamus also contributes to fruit formation. Hence, apple is called the false fruit. Question 15:	What is meant by emasculation? When and why does a plant breeder employ this technique? Answer: If the female parent bears bisexual flowers, removal of anthers from the flower bud before the anther dehisces using a pair of forceps is necessary. This step is referred to as emasculation. This method is useful to prevent self-pollination in bisexual flowers. This helps the plant breeder in introducing desirable characteristics in a plant. Question 16:	If one can induce parthenocarpy through the application of growth substances, which fruits would you select to induce parthenocarpy and why? Answer: I would use parthenocarpy for producing oranges. Seedless orange would offer many advantages. Eating a seedless orange shall be more convenient. Extracting juice from such an orange shall also be more convenient. Question 17:	Explain the role of tapetum in the formation pollen-grain wall. Answer: Tapetum provides nourishment for developing microspore. Tapetum is also the source of precursor of pollen walls. Question 18:	What is apomixis and what is its importance? Answer: Some plants produce seeds without fertilization. This phenomenon is called apomixis. Example: some species of Asteraceae and grasses. Apomixis can help a plant in spreading its geographical presence without the need of taking help from agents of pollination. It can also help in improving farm yield in some selected plants.